No series on Moroccan food would be complete without at least one or two recipes for harissa. So here at last, is a recipe for one that will rock your world! 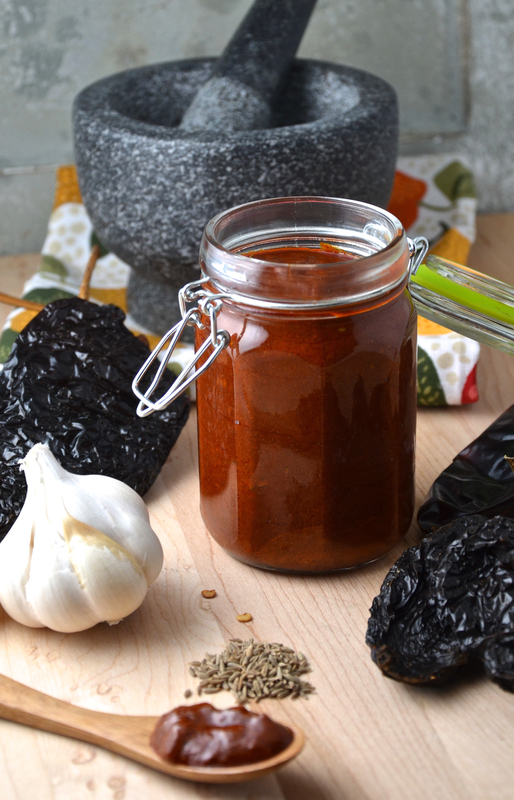 By now you will have noticed many Moroccan recipes calling for this zesty condiment. It is ever present in soups, tagines, and cousous recipes and is found at every Moroccan table, used like we Canadians might use ketchup. Recently, I read that if we didn’t feel like making our own harissa, we could use store-bought sambal olek as a substitute. Well, I beg to differ! This recipe makes sambal olek taste like thin tomato juice. A dollop of harissa in your soup, or chili will add a, luxurious heat and depth of flavour with a mysterious smokey undertone. There really is no comparison to any commercial hot sauce. Harissa is definitely in a class of its own. I made two jars of it, and the first jar disappeared in a couple of days. My husband and I ate it in everything: soup, vegetables, rice, potatoes, and even mixed with mayonnaise, as an exotic sandwich spread. I found this recipe in a must-have cookbook for any Moroccan food enthusiast, “Mourad: New Moroccan”, by Mourad Lahlou. 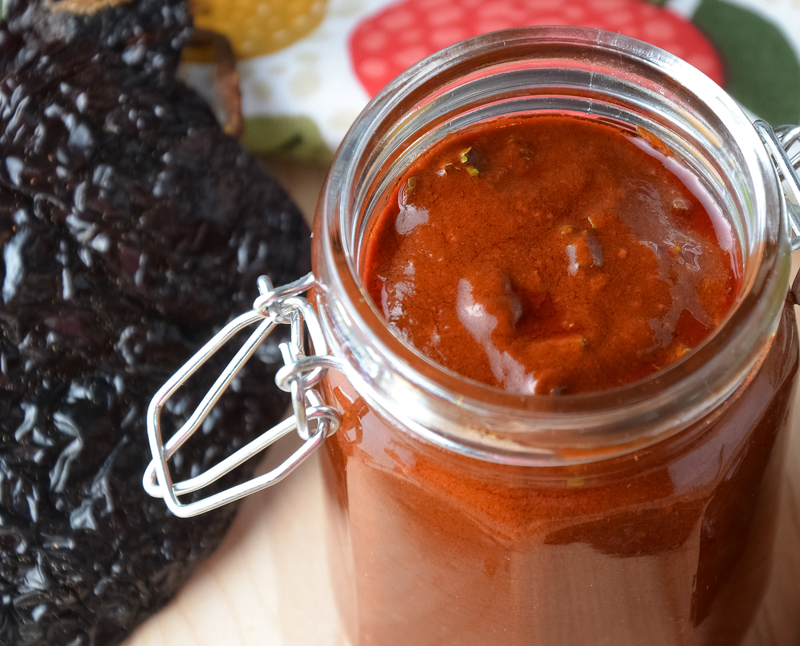 I am excited to be bringing a big jar of Smokey Moroccan Harissa over to Fiesta Friday! I know that most of the gang there love hot and spicy, so I think the recipe will be appreciated. If you haven’t visited Angie of The Novice Gardener’s, Fiesta Friday yet, please come and check it out! We love new visitors! Put the chiles in a large bowl and add enough boiling water to cover. Place a small plate over the chiles and push down into the water to keep them submerged. Cover the bowl tightly with plastic wrap to keep the heat in and let them soak for 1 hour. Drain the chiles, reserving the soaking liquid. The pepper should be completely softened; if any are not, return them to the bowl, cover with more boiling water and then plastic wrap and let soak until softened. Let the soaking liquid sit so any silt settles to the bottom, then scoop out about ½ cup and reserve it. Wearing rubber gloves, pull off the stems from the chiles, then break them open and discard the ribs and seeds. Put the chiles in a food processor and pulse the motor to chop them, adding just enough of the reserved soaking liquid to help the machine break up the chiles. Add the olive oil and blend until smooth. Add the salt, pepper, cumin, cayenne, and garlic and puree until you have a smooth paste. Add the vinegar and puree for another 30 seconds. Check the consistency: the harissa should be a bit looser than a mayonnaise. Add more of the reserved liquid if necessary. Strain the harissa through a fine-mesh strainer and stir in the parsley, cilantro and lemon juice. Taste a small spoonful and add additional salt if you think it needs it. Store in the refrigerator in an airtight glass jar, with a film of olive oil on top for up to 3 months. I love this harissa in soup and chile! You know me, always one for a Moroccan recipe, and always happily making my own Harrissa! 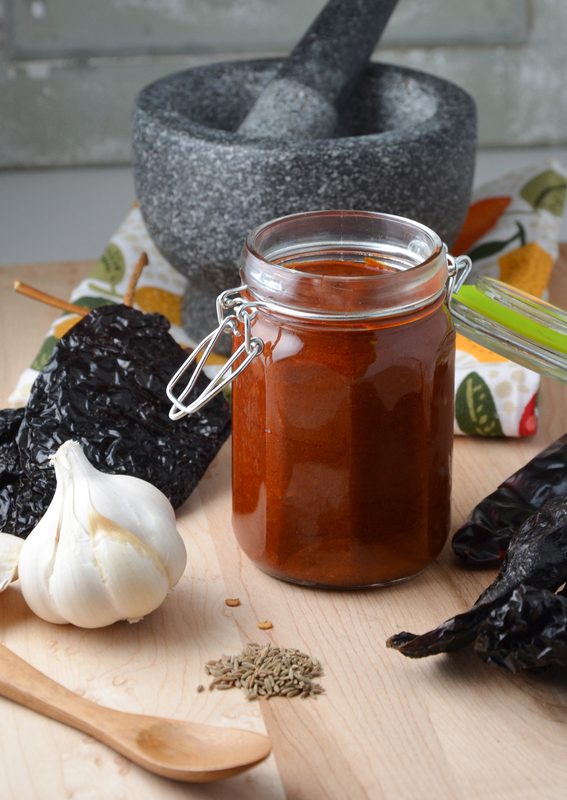 This looks great – I’ve got dried chipotle chilli’s but I’m not sure about finding the others, do you think it matters if it’s not the exact selection that you used? PS do I need that cookbook?? Oh yes, I would highly recommend it! I’ve never tried Harissa, Chef Julianna. Is this nearly similar to Sriracha sauce? 🙂 Thanks for sharing this – it feels like I wanna drink the whole bottle? Hahaha. Hey Jhuls! It has so much more flavour than Sriracha! Oh, and don’t eat the whole bottle! Phew! You would get a terrible stomach ache! Gorgeous! And you know I love anything made from scratch! Can’t wait to try this one out! 😀 Happy FF! I just happen to have a Moroccan tagine cooking at the moment! Love Moroccan food, and harissa though have never tried making it. This will hopefully prompt me! I am saving this recipe Chef ! So making it :). Sure hope that you like it, Sonal! I LOVE harissa! You make it sound so easy that I have to kick myself for ever having bought a jar! I’ve never had harissa before, but love the use of all those peppers! Oh, Julie! You should just go for it! It lasts a long time in the fridge! Thank you Julianna! I pinned it for a harissa day! Thank you so much, darling, for this lovely recipe!! I love Harissa and the pictures are gorgeous! Such a lovely post!! Great photos and looks delicious :)?